Finally three points, and so much more than that. Banbridge Town bagged a vitally-needed first league win of the season on Saturday as they eased past Portstewart with a 2-0 victory. It’s a victory that lifts Ryan Watson’s side off bottom spot and within three points of clearing the relegation places. Goalkeeper Tuda Murphy returned from injury to replace Stephen Croft who was unavailable, while Conor Downey was restored to the starting line up alongside Chris Kingsberry. Marty Buchanan dropped to the bench while Town were also without Ryan Gourley, who was on holiday. Neil Barr kept his place up front. 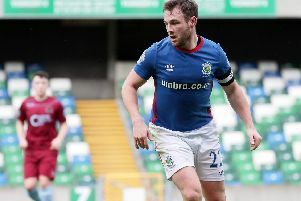 There was a familiar face in the Portstewart side, ex Town player Stephen O’Neill, who was the leading goal-scorer only two seasons ago lining up against his old club. The match got off to a flying start with Banbridge pressing high and playing with the same intensity as their last two games. Captain Ryan Moffatt was causing problems as he drifted in from the left to get on the ball and pull the strings, while tireless running from Conor Downey gave the Town some much needed bite in the final third. The match was barely four minutes old when Banbridge won a corner which was whipped in by Ryan Moffatt, and met with a bicycle kick from Downey at the back post to bury the Town’s first chance. This was proving just the tonic the local side needed, as two minutes later Conor Downey broke through again but his shot dragged wide under pressure. Banbridge were playing with a great intensity, pressing every touch taken by their visitors and exploiting the large gaps left open by the Portstewart midfield. Banbridge were unlucky not to bag a second when Moffatt, Downey and Chris McGrath all combined well with one touch play which deserved a finish but the move was cut out. With 19 minutes on the clock, Banbridge added a second, again from a corner which looked straight off the training ground. Moffatt ran late across the box to meet the whipped cross and cushion it into the net. Portstewart worked hard to try and find a way back into the game but the visitors were caught offside time and time again as they began to try and force the issue. Tuda Murphy had little to do in the first half, mostly down to the efforts of Glen Waddell and Stephen Greene who were looking solid. A rare chance for Portstewart came after half an hour when winger Chris Hansen pulled the ball back for O’Neill who had the goal at his mercy only for a fantastic sliding block by Greene to deny the shot. As the half drew to a close, Portstewart were awarded a penalty when a dangerous run from full-back Ryan McAllister caused trouble before he was dragged down in the box. The resulting spot kick taken by Matthew Hynds thumped off the cross bar and was cleared - not Portstewart’s day it would seem. The second half allowed the Town to take their foot of the pedal a little. Portstewart got a lucky break, picking up a loose ball only for Stuart Thompson to cover well and snuff out the attack. Banbridge continued to worked hard as they sought to notch a killer third goal, with their best chance coming from a searching ball from Moffatt which found Kingsberry on the right, with the resulting cross into Chris McGrath who was unlucky not to finish. Banbridge looked in control from the first whistle to the last as they were first to every ball; their work rate and concentration never dropped. Banbridge have a free weekend next week as its Round Two of the Intermediate Cup. Their next fixture is on 7th November with an away trip to PSNI, who have been knocked off the top after two defeats in a row. Having got that much-needed first league win, Town will go to Newforge with increased confidence and belief that they can take all three points. TOWN: Murphy, Thompson, Greene, Waddell, Wilson, Moffatt, Anderson, McGrath, Kingsberry, Downey, Barr. Subs: McParland, Stoddart, Buchanan, Jones, Pedlow.